Every year, I feel like the yearning, groaning, primal scream of the Shofar isn’t only coming out of that shiny ram’s horn. I feel like it’s coming out of me as well. 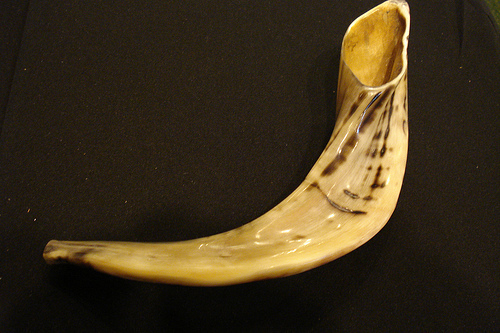 And every year, as I let out that whispered scream in harmony with the shofar’s cries, I yearn for the same thing. I yearn to feel Hashem’s presence. Not only on Rosh Hashana, when the air of the universe all the way from my front steps to Pluto is dense with holiness. But also to feel my Father in Heaven with me on October 17th when I’m feeding my kids grilled cheese sandwiches for lunch, and on April 2nd when I’m sitting on a playground bench breaking up fights and fighting off flies, and on July 10th when the house is finally still and quiet and I can hear myself think after a too-long, too-full Weisberg family day. What I desire more than anything when I hear that shofar is to feel Hashem with me during all those moments and hours and years when I feel like I’m all alone, but I’m really, really not. When I feel like I’m flying solo, but in reality I’m nowhere near the cockpit. When I came across this intensely painful video of Moishy Holtzberg calling for his “Eema” right after his mother’s death, I realized that little Moishy at that moment was also transformed into a shofar. He calls out for his mother, just like we call out for our Father year after year. Moishy yearns for her just like we too yearn for our Father in Heaven and the comforting warmth of His embrace on a cold and empty day. on rosh hashana, my husband and I davened in a shul up north where little moishe’s great uncle is the rav. we asked about moishe and he is doing very well. he started preschool (cheider) and is very happy. we will always remember his cry for his parents.